This offer is only open to the thousands of visitors to Talking Electronics website who want to build something but don't have the funds to buy the boards or the kit(s). Many countries don't have PayPal or payments as low as $5.00 represents a day's wage. We have a number of PC boards that were made in 1,000's instead of 100 by a previous manager and are now available for no cost. We also have some recent boards with a track missing or the overlay missing and rather than throw them out, the are available too. All boards come with corrections and the projects are on our website. You will also get a small matrix board and a small pack of half-used components - used in experiments. Copy and paste this in an email and indicate the boards you want. A CD of the whole website is available for $10.00 posted to anywhere in the world. 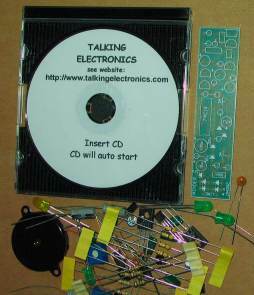 The CD comes with a small bag of electronic components including surface-mount items. Or email Colin Mitchell: talking@tpg.com.au for details on sending for the CD plus other kits etc. A Square Wave Oscillator Kit is available from Talking Electronics for under $10.00. See full details of circuit below. A kit of components to make many of the circuits described in this eBook is available for $10.00 plus $7.00 post. 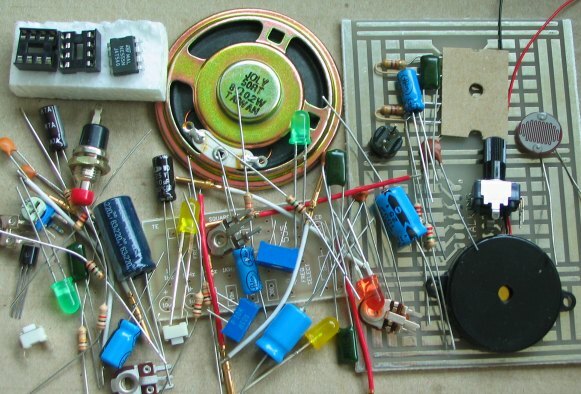 There are more components than you think. All kits contain more components than on the list. 3 Printed circuit boards: MAKE ANY 555 PROJECT are available for $10.00 post free to ANYWHERE IN THE WORLD !! !.